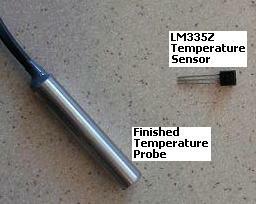 We include a pair of LM335Z temperature sensors with our solar water heating pump controllers. They are reliable, relatively inexpensive, and very easy to use, however they do have one disadvantage – they are not at all waterproof. One sensor has to be fitted to the side of the hot water tank under the insulation – typically a nice dry area – but it can sometimes be difficult to find a dry area on the outlet pipe of the solar water heating panel as this is located outside. In some situations (such as heating swimming pools) the temperature sensor must be permanently submerged. Therefore in this article we will look at how a standard temperature sensor can be turned into fully waterproof temperature probe. Making a waterproof temperature probe from an LM335Z is actually quite simple, requires few tools, and the component parts required are inexpensive. In short the temperature sensor must be soldered to insulated leads, and the soldered joints protected with heat shrink tubing (to prevent short circuits). The sensor is then inserted into a suitably sized stainless steel tube of around 50mm length (6mm inside diameter for LM335Z sensors), and filled up with epoxy potting compound. The potting compound is impervious to water, the stainless steel tube, will not corrode, and the steel-epoxy combination will transfer heat to the temperature quickly enough for pretty much all solar applications. The leads sticking out of the epoxy at one end of the tube can then be connected up as required. This same technique can be used to waterproof other sensors and components as required. You just have to find stainless steel tubing with the correct inside diameter for the sensor/component to be waterproofed. The only disadvantage of waterproofing temperature sensors in this way is that they are a little slower to respond to changes in temperature as the stainless steel and epoxy insulate the actual sensor from the external environment as well as protecting it from water. This only becomes an issue when there are rapid changes in temperature of the thing being measured which we have found not to be the case for example with our solar water heating pump controller for swimming pools (REUK Waterproof Solar Water Heating Controller for Swimming Pools). Stainless steel tube is not a very easy thing to find, but fortunately there are many sellers on eBay UK who have it on sale. Click here to search for the latest listings for Stainless Steel Tube. Similarly, click here for Potting Compound, and here for Heat Shrink Tubing. Another temperature sensor which we use very often is the DS18B20 digital temperature sensor. It is our sensor of choice for all our Arduino and Raspberry Pi projects for example – see our article DS18B20 Temperature Sensor with Raspberry Pi for details. The DS18B20 is typically around double the price of an LM335Z, but they are available ready waterproofed with a nice long cable attached (pictured above) for a very reasonable price – for example ten waterproof DS18B20 sensors delivered anywhere in the world for around £12, i.e. just over £1 each. 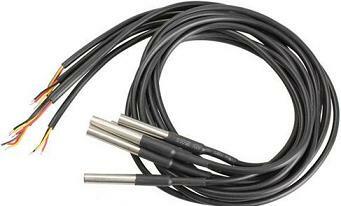 Click here to buy waterproof DS18B20 temperature sensors now. DIY Submersible Temperature Probe – from Home Brew Talk website.